Aaron Long: How did The City On The Other Side come together as a project? Mairghread Scott: I’m a sucker for fairy tales and any place that seems magical or impossible. Growing up near Detroit, I loved the parts of the city that had been retaken by the forest: a tree that grew through a house, a street that dead-ended in the woods. But the most magical city to me has always been San Francisco. I was born there but left when I was a baby so I grew up hearing wild stories about it. The entire town took on the tone of a fairy tale city to me. Since The City On The Other Side is about a young girl, Isabel, who goes on an epic quest through the mundane and magical sides of San Francisco, it was also my chance to explode this ‘fairy tale’ city I was born in while bringing the most magical parts of the city I grew up near with me. Of course, creating two cities and all the fairies and humans that live there was going to be a really tall order. I was hunting for an artist when I came across Robin at Emerald City Comicon and she had the most amazing posters of mermaids and medusas and all kinds of beasts. When I found out she did sequential art (i.e. comics) as well, I knew I had to get her onboard. 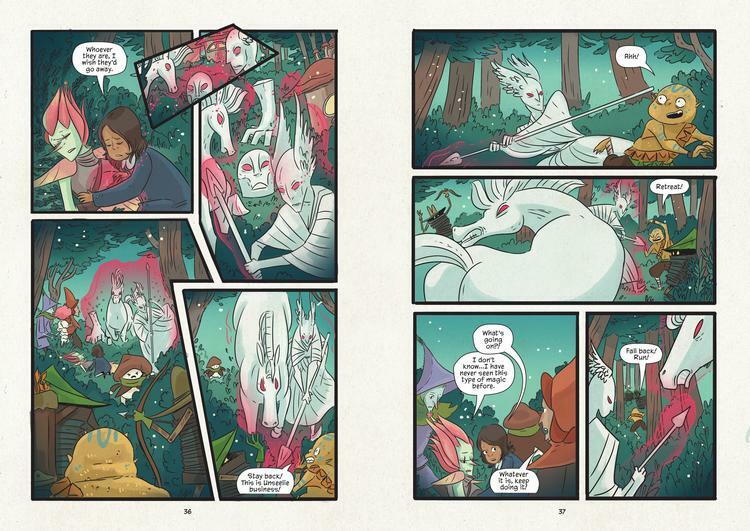 We pitched the idea to First Second (the two-page spread of Fairy Chinatown in the book was in our original pitch document) and the rest is history. 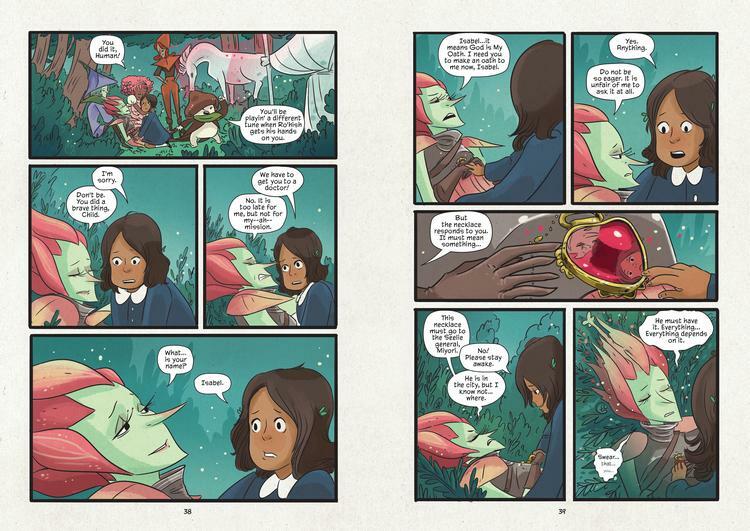 Robin Robinson: It was so great to see this message from a venerable comic book writer in my inbox asking if I was interested in working on a pitch for a “slight dark Miyazaki-style fairy tale”–and I just got more and more excited as she elaborated. It was so completely up my alley! I had been working on not-at-all-all-ages comics independently, but kid lit is where the rest of my career lies and it was magical to finally get those things working together. AL: What about 1900s San Francisco drew you in as an initial setting for the story? MS: I’d always heard about the terrible 1906 earthquake (the Great Quake) and it seemed like such a terrible, almost Tolkien event — the quake, days of fires, the whole city basically getting wiped out. So I made it that start of our fairy civil war… the war that Isabel gets pulled into and is trying to end. Also, by grounding the story in the 1900s we were able to get a lot of photo reference to make it feel real while still feeling like a bit of a different even on the human side of the city. RR: I was also parted from San Francisco at a young age but it never really left me, so to research into photos and maps and fashions and history of the 1910s in The City felt like going home. In some ways, that era reminded me more of my childhood visits than going back there now! Which is kind of a ridiculous thing to say since this book is set pre-Golden Gate Bridge, etc. AL: Can you give me a rundown of who Isabel is, and how she gets drawn into the feud between the Seelie and Unseelie Courts? MS: Sure! Isabel is the daughter of a very wealthy San Franciscan family whose parents are basically separated (but, you know, not officially because it’s the 1900s). She’s set to spend the summer with her father in Carmel-by-the-Sea, and ends up stumbling upon a dying fairy messenger. Turns out, the fairies of San Francisco are at war! The terrible Unseelie Prince Coscar has taken over the entire city after kidnapping his counterpart, the Seelie Princess Id’naress and hiding her somewhere. This messenger was delivering a magical necklace powerful enough to end the war, but she dies before she can finish her task. 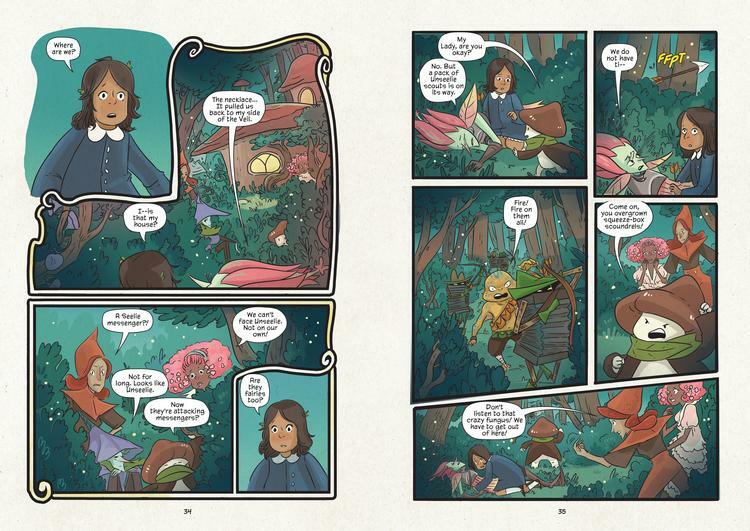 Isabel takes the necklace and fights her way through the fairy side of the city along with the help of a bossy mushroom spirit named Button and a human boy named Benjie who was orphaned in the Great Quake. RR: Isabel is so quiet and demure and stepped on, but under all that she’s fierce and kind and adventurous. She might be the kind of kid who is quiet and easily overlooked, but if you get to know her-or give her a chance to show you who she really is—you won’t forget her! AL: The Fairy world in The City On The Other Side is beautiful, dynamic and enveloping. What was your favourite part about building this world? MS: All the fairies and mythical beings Robin designed. To better reflect the different cultures of the city we tried to draw “fairies” (mythical beings that aren’t gods) from as many cultures as we could. You’ll see everything from Native American to Chinese beings, local plant and animal spirits and a couple “just for fun” designs like our accordion archers. RR: Organic architecture that might have grown that way instead of being built was so fun for me—but filling shops with things that the wildly different fae might need was, while time-consuming—eminently satisfying for me. AL: You can only choose one: who is your favourite character in The City On The Other Side? MS: Spine! Prince Coscar’s vicious lieutenant and the main person hunting Isabel. She’s a marrow (a sort of evil mermaid) and so we gave her the power to swim through the ground. I love that she’s deadly and very dedicated to her cause, but she’s not just evil. Spine and the Unseelie have legitimate complaints, but when Coscar starts to cross the line she and the others begin to doubt his leadership. Uh-oh! RR: I almost would have picked Spine, too, but I’ll be interesting and go with my (very close) runner-up, Benjie! If I put myself in the mindset of my own childhood self, Isabel is who I’d want as my best friend, but Benjie is who I’d want to be: someone competent and confident who still makes mistakes and gets forgiven. Also cool boots and stylin’ suspenders. AL: Mairghread, you are well known for your work in the Transformers universe. Does your approach as a writer change if you are building your own world or working on a licensed property? MS: Somewhat. Since I’m building my own world I had to introduce people to it more, pull the reader in. But keeping it set in a real time and place gave me a lot of guardrails and guidelines to work with: Isabel became Hispanic because there were a lot of wealthy Hispanic families in the city at that time. We used real streets and old maps of the city to make sure you could follow Isabel and Benjie’s route on their adventure. How people looked and acted were more set because of the reference we found. So in a lot of ways it’s the same process. My “license” just became ‘1900-1910s San Francisco’ instead of Cybertron. AL: Robin, your character design sketches in the back of the book are fantastic. The one that caught my eye throughout the entire story, and in the sketches, is Button. Can you talk about the process of how you landed on the final design for the character? RR: Button was my favorite character to design and he really came together so smoothly. With the humans and the more humanoid fae, we had a lot of things to consider with how their look would change the story or fit into the world, what they would communicate to the reader, etc…but Button was a wise-cracking mushroom Yoda and I think we both knew it, so it just flowed. Mushrooms and organic shapes are always me fave to draw, and pushing things to be more stylized is great for my ability to make them expressive. Also his leaf scarf is 100% my own sense of style, so I hope he’ll tell me where I got it. AL: Any final words about The City On The Other Side? MS: Only that I’m so excited to finally share it with people. 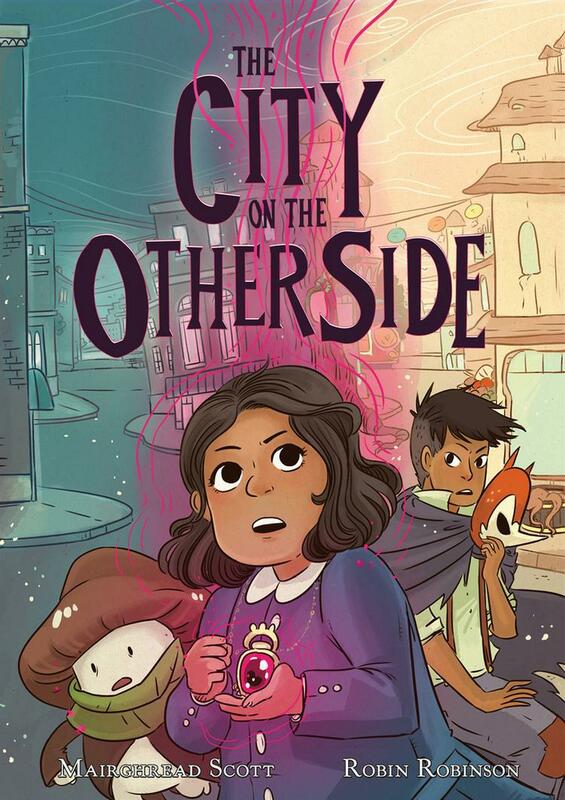 The City On The Other Side is really about a young girl learning to find her voice in this world and use it to make the world better. I’m so grateful to Robin and First Second for helping this book find its voice and I hope putting it out there will make the world a little better too. 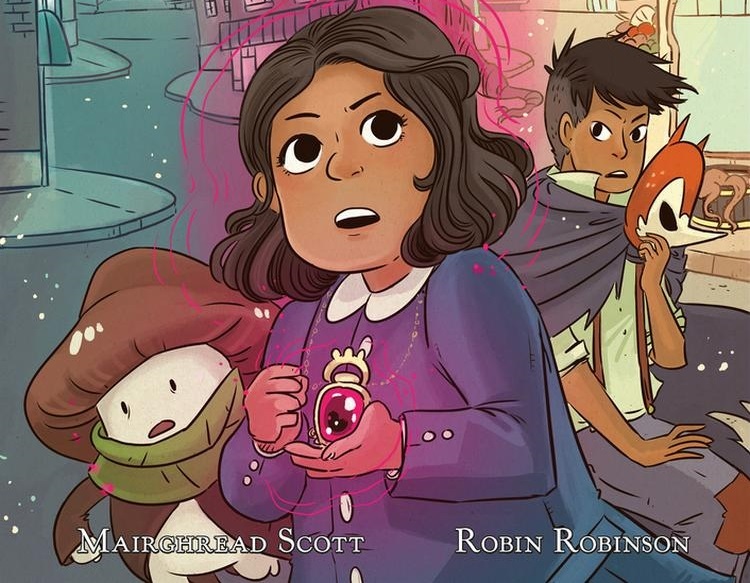 RR: This book has so many moments of darkness and danger and glimpses of warmth and hope, I am excited for it to be in the hands of young readers who might get inspired to know more about the folklore and history we touch upon, and who will maybe start seeing the magical side of their own city.